In the summer of 1912, Minnie Marx had a novel idea: she started a school for chorus girls. It may have solved a few problems but it ended up causing many more and was a short-lived plan. From the freshman class at Minnie’s school came Kathleen Fleming, born in Fairmount, West Virginia on April 26, 1895. During her first season on the road with the Four Marx Brothers Kathleen began a romance with Arthur Marx that lasted three years. Their breakup led her to quit the act and sue Arthur for breach of promise. The Marx family was very much opposed to Arthur and Kathleen marrying. She was awarded an embarrassingly meager sum in court and moved on with her career. She joined a vaudeville act that featured a few other former Marx Brothers cast members. George Lee & Company toured with an act called “At the Golf Links” for the 1915-16 season and when the seven-person company added a member they became known as George Lee and His Eight Swagger Sweethearts. The following season found Kathleen on the road with the touring company of the play Mutt and Jeff’s Wedding. Her stage career ended in 1920 when she was in the chorus of the Charlotte Greenwood play Linger Longer Letty. Kathleen was fired from the show under lurid circumstances when she was discovered in bed with Charlotte Greenwood’s husband and co-star, Cyril Ring (who would later appear with the Four Marx Brothers in The Cocoanuts.) Before appearing in Linger Longer Letty, Kathleen had married a mining engineer named Donald F. Watson in 1919. Apparently, Watson was an open-minded and forgiving husband, because after the incident, he took his wife to Brazil on an extended business trip. They spent two months in Rio de Janeiro in 1921, but the marriage didn’t last. By 1925 Fleming had married for a second time, to advertising agent George Winfield Benson Pressier and they settled in New York. This marriage lasted more than 25 years and ended when Kathleen Fleming Pressier died of colon cancer on October 10, 1950, at the age of 55 in New Milford, New Jersey. Harpo Marx created a highly fictionalized composite girlfriend character named June Fleming in his autobiography Harpo Speaks! but she bears little resemblance to her namesake. Manuel Frank had a very brief association with the Marx Brothers. When the Four Nightingales returned to New York in the spring of 1909 after a particularly arduous southern tour, they decided to move to Chicago, and worked their way to their new home. One of the Nightingales wanted no part of this plan. Being the only one of them with any say in the matter – he wasn’t a son of Minnie Marx – Lou Levy remained in New York. Manuel Frank, Levy’s replacement was born in Russia to German parents on October 16, 1892 – five days before fellow Nightingale Milton Marx. (See Fred Klute biography for similar odd coincidence concerning Milton’s birthday.) The Four Nightingales — with their newest member — were booked all summer and headed west. Traveling across Indiana, they spent a week in Indianapolis at the Gayety Theatre, where they gave their final documented performance on November 13, 1909. Manuel Frank was gone as quickly as he had arrived. He spent most of his life around Boston, Massachusetts and seems to have never worked in show business again after his final performance with the Four Nightingales. When he registered for the draft in World War I he listed his occupation as a clockmaker. In his later years a Boston garment manufacturer employed him. He died in May 1964 in Baltimore, Maryland. Frederick C. Klute is an unfamiliar name to Marx aficionados, but his alter egos Freddie Hutchins and Freddie Watson appear in Groucho Marx’s colorful recollections of the Marx Brothers’ early act the Six Mascots. Klute, born in Chicago, Illinois on October 20, 1892 – one day before his fellow Mascot Milton Marx – joined the act in December 1909, shortly after the Marxes relocated to Chicago. Klute’s father was a saloonkeeper in the Marx family’s new neighborhood, and the Klute family lived nearby. The Six Mascots lasted less than a year and by October 1910 Klute’s time with the Marx Brothers was finished. He had some minor vaudeville success in 1912 and 1913 as part of Bennett, Klute and King, a singing and dancing act. He operated a poultry farm near Hartford, Michigan, for several years in the 1920s and 1930s and spent his last years in Coloma, Michigan. At the time of his death on January 4, 1942, in Benton Harbor, Michigan, Klute—like his father—was the proprietor of a tavern. Florence Aster, born on June 11, 1899, was the first cousin of Chico Marx’s first wife Betty Karp. (Her mother, Rose Karp Aster, was the sister of Betty’s father, Charles Karp.) 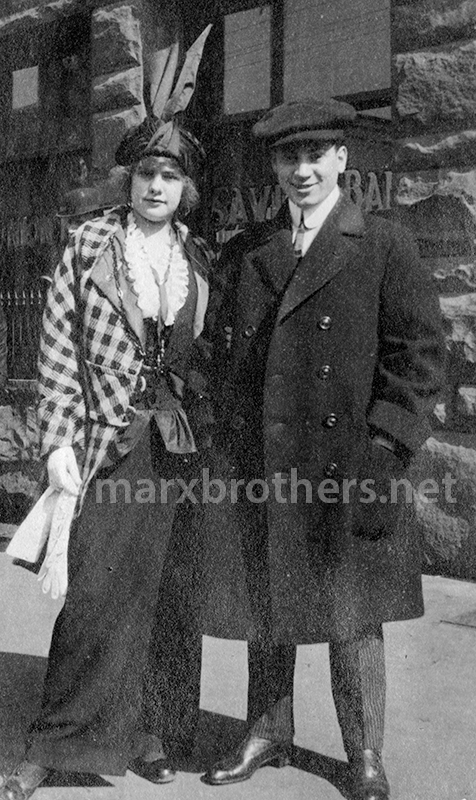 On May 28, 1922 Florence married Oscar “Mike” Mirantz, (b. April 14, 1891 – d. January 29, 1977) a boyhood friend of the Marx Brothers she had been introduced to by Chico. She was around the Marx family constantly from the time Chico met and married Betty in 1917. Betty and Chico’s daughter Maxine referred to her cousin Florence as “Aunt Flo” and they remained close for the rest of their lives. Aunt Flo was like a fly on the wall as she was witness to just about every significant event in the lives of the Marx Brothers for several decades. She died on October 23, 1994. Mabel Blanche Mordaunt was born in Springfield, Massachusetts on September 14, 1886. She began a promising theatrical career in her hometown, and in 1905 headed for New York. She soon landed a job in the chorus of Wonderland, a Victor Herbert musical adaptation of the Brothers Grimm story, “The Dancing Princess,” which had a run of seventy-three Broadway performances. The following year she had a featured role in a touring play called The Man of Her Choice. Also in the cast was sixteen-year-old Julius Marx who quickly developed a crush on Mabel. They toured together in the play for seven months, but Julius made no romantic progress – although he did pick up some additional income from walking Mabel’s dog. Mabel’s leap from obscure chorus girl to featured player apparently had a lot to do with her romance with Edward M. Simmonds, the writer and producer of The Man of Her Choice. In 1909 Mabel appeared with DeWolf Hopper in The Pied Piper. In 1910 she married forty-year-old actor William Norris, her co-star in the show My Cinderella Girl. She retired from the stage when her son, William Norris, Jr. was born and kept out of the public eye until her husband died in March 1929. Mabel became the subject of some scandalous reports in the press the following year when her husband’s family went to extreme lengths to keep her from inheriting the Norris fortune. On the summer day in 1905 when Gene Leroy hired singer Julius Marx at an audition for the Leroy Trio he also rounded out his trio by hiring Johnnie Morris, a dancer. Morris was born to Russian immigrant parents in New York City on June 15, 1887. For Johnnie Morris and Julius Marx, the Leroy Trio was a very brief experience. It was all over in six weeks. But they both remained in show business for the rest of their lives – although with much less fanfare for Johnnie Morris. In 1906 Morris was half of Morris and Kramer, a blackface act usually billed as the Dancing Demons or the Two Black Dots. They split up in 1909 and Morris was next working with a new partner in Morris and Morton, another dancing blackface act. During the next several years Morris worked solo and got married twice – although the second marriage may never have been legal, since it predated his divorce from the first Mrs. Morris by two years. He also reunited Morris and Kramer, and worked in movies. (He was seen in two Selig-Polyscope shorts released in 1912: A Safe Proposition and The Little Match Seller, as well as the 1919 Woman’s War Relief Fund short, The Madonna of the Slums.) Morris worked with several other partners in vaudeville before settling on the one he would stick with for the longest time: his second wife, Edna Brennan. She worked under the stage name Edna Towne, and Morris and Towne began touring vaudeville in 1920 with an act called “A Fool for 12 Minutes.” They moved to Hollywood in 1927 and Morris began a long career as a bit player in movies. He mostly worked as an extra, but on occasion alongside stars such as Bebe Daniels, Emil Jannings, and Maurice Chevalier. The highlight of Morris’s film career was his performance as Pappy Yokum in the 1940 version of L’il Abner, with a cast that also included Buster Keaton. Morris would spend his retirement years putting on shows for the residents of the Motion Picture Country House. He died on October 7, 1969, in Hollywood. His Variety obituary noted his 65-year career on the stage, indicating that Johnnie Morris and Julius Marx were both new to the business when they worked in the Leroy Trio in 1905. For the avoidance of confusion, there were two Minnie Palmers familiar to the world of show business during the Marx Brothers years in vaudeville. But the Minnie Palmer whose real name was Minnie Schoenberg Marx was never one to discourage any confusion between the two. The original Minnie Palmer was born in Philadelphia, Pennsylvania on March 31, 1860. She started her theatrical career when Minnie Schoenberg was a ten-year-old girl in Dornum, Prussia. Palmer had temporarily retired from the stage and moved to England around the time of the appropriation of her name during the Marx family’s early days in Chicago. Numerous articles about the Four Marx Brothers attributed the career of Minnie Palmer to their mother. The confusion posed no problem until John R. Rogers, the original Minnie Palmer’s former husband and manager, finally noticed Minnie Palmer, the vaudeville producer in 1918. Palmer was a twenty-three-year-old actress with mixed notices when Rogers, twenty years her senior, took over the management of her career in 1883. He signed her to a contract stipulating she could not get married for five years. Presumably this clause would be overlooked if she chose to marry Rogers, which she did in 1884. Rogers had long shown signs of instability. He was an obsessive writer of letters, many ending with a salutation that would prompt the press to give him the nickname, “Yours Merrily.” But many of his letters were anything but merry. On November 18, 1890, the New York Times reported: “This thing of writing abusive letters is an old trick of Rogers’s. His communications are always insulting and sometimes obscene.” In 1902, his letter writing earned Rogers a brief stay in the psychiatric ward at Bellevue Hospital. By the time “Yours Merrily” had a letter complaining about Minnie Marx’s using the name Minnie Palmer published in Variety on August 16, 1918, he was more than a decade removed from any involvement in the affairs of his former wife. Rogers was mostly forgotten by this time, but it was likely that Minnie Marx was aware of his reputation as a troublemaker. It isn’t known whether Minnie Marx feared a reprisal from Rogers, but there wasn’t much she could do about the press’s referring to her as Minnie Palmer. The name had for years been associated with the Four Marx Brothers and would continue to be. To this day confusion remains as to whether on not the mother of the Marx Brothers was the musical comedy star of My Sweetheart and other hits of the Gay Nineties. By the time the original Minnie Palmer died on May 21, 1936 Minnie Marx had been dead for nearly seven years. None of the obituaries of the original Minnie Palmer seem to mention the Marx Brothers. This Minnie Palmer was childless. 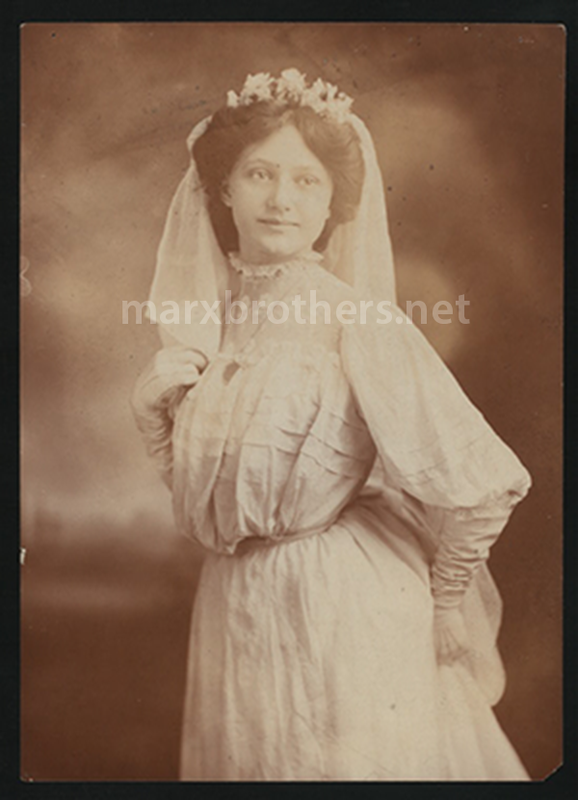 Minnie Marx had a very talented brother in Al Shean – half of the legendary vaudeville team of Gallagher and Shean. She also had a rather untalented one in Harry Shean. Born Heinemann Schoenberg in 1873 in Prussia, the Marx Brothers’ Uncle Harry tried to make it in show business several times – with a lot of help from Minnie, and the built–in advantage of being Al Shean’s brother. But nothing could overcome the fact that Harry just was not meant to be a performer. In the summer of 1899 Harry found work in a pair of touring shows – In Greater New York and On the Stroke of Twelve. That fall he briefly tried his luck in vaudeville as a Yiddish comedian. Around this time Harry is alleged by the Marx family to have starred in a fake ventriloquist act with approximately seven-year-old Milton Marx stuffed inside his dummy. This series of failures led Harry to even greater heights in vaudeville when he somehow landed a job as a German comedian in Jule Walter’s Side Tracked Company in 1906. A year later he was half of Shean and Williams, an act in which he essentially copied Al Shean’s German dialect act. Next he was the star of something called Harry Shean and Company. (Minnie was never short on nerve.) Harry’s last hurrah in show business came in 1913. 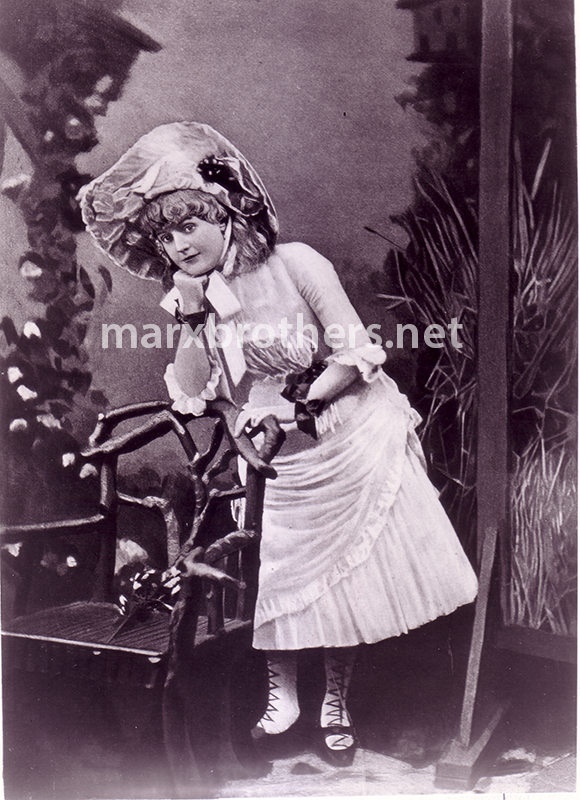 Minnie, by that time a successful vaudeville manager put Harry to work in an act called Orange Blossoms. It was about as successful as Harry’s previous endeavors and would mark the end of his stage career. He stayed on the fringe of the business by managing an all-girl orchestra. He advertised for musicians in New York newspapers, and on June 14, 1916, he married one of them. Clara Messick was known as “the Girl with the Harp” in music circles and was around fifteen years younger than Harry. She was from Arkansas and they relocated there shortly after their marriage. In 1918 Harry was working as a locomotive machinist in Grannis, Arkansas and he and Clara had a son, Harry Jr. They soon moved to Crawford Village, Nebraska where Clara was a musician in a local theatrical company and Harry worked as a house painter. In 1924 Minnie was mostly retired from show business, but was manufacturing Gallagher and Shean–branded soft drinks in a shop located near her home in Richmond Hill, New York. In the nearby Queens community of Woodhaven, Minnie Palmer was brewing Gallagher and Shean Ginger Ale and Sarsaparilla. And even though she could never get her brother Harry’s show business career off the ground, no lack of talent would prevent her from putting him to work in the soda business. Harry moved to Woodhaven after several years in the Midwest. In the 1925 New York census Harry proudly listed his occupation as “mineral manufacturer.” When the soda business fizzled out Harry found work as an awning salesman. He died in New York on October 26, 1937, at the age of 65. The Marx Brothers practically worshipped their Uncle Al, but apart from jokes about his lack of talent, generally didn’t have much to say about their Uncle Harry, who all concerned agreed was a very nice fellow who couldn’t sing, dance or tell a joke very well. Vaudeville superstar Al Shean had five famous nephews in the Marx Brothers, but he also had a less notable nephew. And like his cousins, Louis Lefevre wanted to follow in Uncle Al’s footsteps. Louis, a product of the brief marriage of Hannah Schoenberg and Max Lefevre was born on September 9, 1881. Many surviving records list his birth year as 1882, but that adjustment occurred early in Louis’s life to account for the fact that his parents were married on June 26, 1881. The Marx Brothers’ Aunt Hannah was nearly seven months pregnant at her wedding. Louis Lefevre, changed his name to Lou Shean and began his vaudeville career in 1898. Lou was present at one of the great tragedies in American history as a member of the chorus in the large company of the Eddie Foy show, Mr. Bluebeard at the Iroquois Theatre in Chicago on December 30, 1903, when a fire broke out at the overcrowded Wednesday matinee, and 602 people were killed within twenty minutes. Lou survived and continued working his way through small-time vaudeville. By 1908, he and a partner named Port Jack were getting good notices with a comedy act called “A Smash-up in Chinatown.” In the spring of 1910 he was a member of Ed Gallagher’s touring company, doing a German dialect character in the famous vaudeville sketch “The Battle of Bay Rum.” (His uncle, Al Shean, would not team up with Ed Gallagher until August of that year, so Lou was really Gallagher’s first Shean.) The sketch would be incorporated into the first Gallagher and Shean production, The Big Banner Show. Lou Shean’s next job was with his cousin Leonard Marx. Billed as Shean and Marx, Lou and Leonard called their act “From Grand Opera to Ragtime,” In Harpo Speaks! Harpo writes: “Cousin Lou was a plain-looking guy who wore thick glasses, but he could sing along with the best of them. 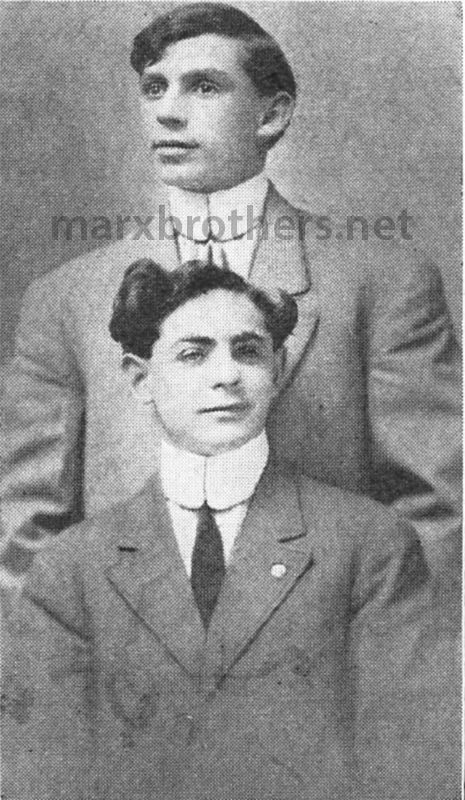 During part of their act, Chico would accompany Lou blindfolded on the piano.” Based in Chicago, Shean and Marx toured the Midwest during the 1911-12 vaudeville season. With his Aunt Minnie guiding his career. Lou soon found himself working in her show The Duke of Bull Durham. The show garnered mostly positive reviews and some particularly nice notices for Lou Shean, who in addition to playing the lead managed the company. When his performing days were over Lou formed Shean’s Vaudeville Agency and booked small-time vaudeville acts for several theaters in the Midwest. By 1930, Lou had retired from show business entirely, taking up a career in the paper business that lasted until his retirement in 1962. He was ninety years old when he died in a Boston convalescent home on January 31, 1973. Margaret Dumont wasn’t the first stuffy, pompous woman with an operatic voice to be tormented on stage by the Marx Brothers. On September 5, 1912, Saba Irene Shepard made her debut as a member of the Marx Brothers Company at the Apollo Theatre in Chicago. She would work with them on and off until her final performance on December 29, 1919 at Keith’s Theatre in Portland, Maine. She toured with the Marx Brothers for six vaudeville seasons during that time, skipping the 1915-16 season when she got married, but returning for the following season after her divorce. She also sat out the 1917-18 season only to return again in the fall of 1918. Saba was born on September 23, 1891 in Washington, Pennsylvania and began performing locally in the Bradford, Pennsylvania area as a teenager. By 1910 she was regularly featured singing illustrated songs at the Star Theatre. She would return to Bradford and perform at the Star during her summer breaks from the Marx Company. Apart from her prolonged absences, Saba also took a couple of shorter leaves from life on the road with the Marx Brothers. In January 1914 she left the company for what was reported in the press as a surgical operation for appendicitis. But in vaudeville this was known to mean that Saba was dealing with an unwanted pregnancy. She returned to the show three months later. She also missed several weeks on the road in June and July of 1919 when she broke her arm during an engagement in Brooklyn, New York. After permanently leaving the Marx Brothers, Saba returned to Bradford where she performed locally and worked as a housekeeper and a hairdresser. She saved her vaudeville money and eventually purchased the Vanity Shoppe Beauty Parlor on Main Street in Bradford. In March 1930 Saba and a nurse took a boat trip through the Panama Canal while she recovered from an illness. In Ancon, Panama she met Air Force clerk Abraham Brill and moved with her mother to Panama in January 1931. She and Brill were married there in 1934 and they relocated to Houston, Texas in 1942. Saba died there on December 12, 1955. When the Marx Brothers realized they could take the Six Mascots act no further, they developed the best part of the act – a schoolroom sketch – into an entire act of its own. Near the end of 1910 they replaced Mascots’ singer Fred Klute with Paul Yale. Yale was born Samuel Paul Aley on December 19, 1891 in Echota, New York. He sang, danced, and played a character described in a 1911 review as “one of those fairy-like creatures who would consider it a sin to finish a meal without the assistance of a finger bowl.” Soon after Yale joined the act, his childhood sweetheart, Margret Davidson was added to the company. Also born in Echota on November 17, 1893, she was performing as a singer and dancer in the Niagara Falls area in 1908, billed as Dot Davidson, The Dainty Soubrette. 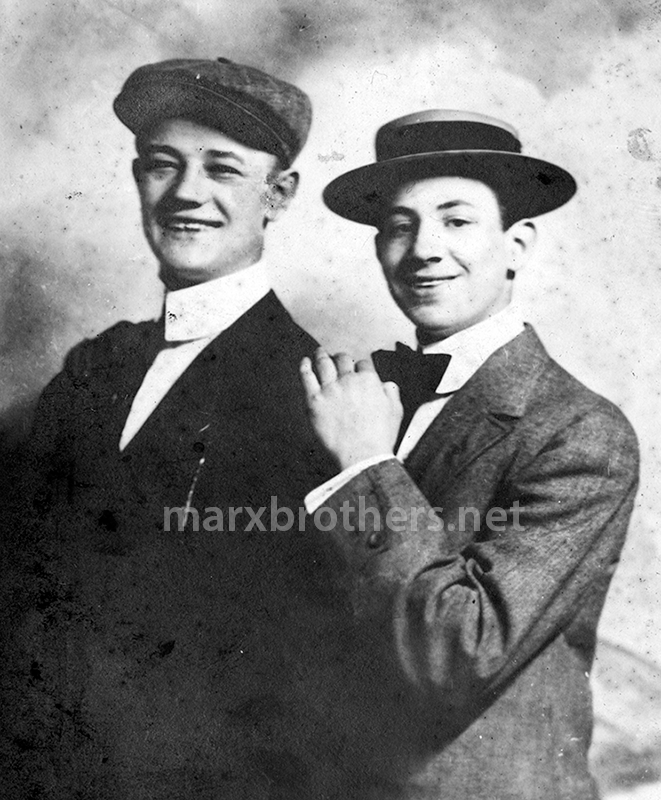 Yale and Davidson were married while in Burlington, Iowa with the Marx Brothers Company on December 19, 1912, Paul’s 21st birthday. Their first child was born seven months later. They left the Marx act in April 1914, and toured vaudeville on their own as Yale and Davidson. They rejoined the Marxes for the 1915 season before going out on their own again. The Yales later worked with stock companies and in burlesque. They eventually had four children and settled in Marine on St. Croix, Minnesota. Two sons, Paul, Jr. and Oakley, became musicians, playing the xylophone and accordion respectively. The family performed together in various combinations. Tragedy struck on November 14, 1933 when Paul, Jr. died at age eighteen in an explosion caused when he lit a cigarette while cleaning his xylophone with gasoline. The Yales retired to Marine on St. Croix, where Dot Davidson died on April 7, 1962. Paul Yale died there on January 6, 1967. They were an important part of the Marx Brothers’ early success, appearing with them in Fun in Hi Skule, Mr. Green’s Reception and Home Again between 1911 and 1916.